Harris Resort is a fine resort with fresh and attractive concept in the bright of orange as their main color. 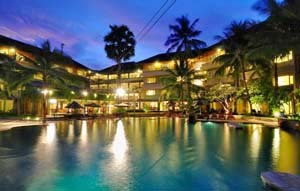 This resort is located on the well known Kuta Beach and entertainment centre of Bali island. From Ngurah Rai International Airport, it will need only 15 minutes to reach this resort, and then to reach Denpasar City from this resort you will need 25 minute drive. The location itself is quite strategic, besides near the beach and entertainments, this resort is also connected to the newest shopping mall in Kuta, the “Beachwalk.” This new department store is a one stop shopping, where you can find fashion apparel ships, restaurants, café, and cinema entertainments. Harris Resort offers 191 comfortable hotel rooms with complete and modern amenities, like plasma TV with international channel, free WIFI, air conditioning, minibars and coffee/tea maker. For outside activities you can check the swimming pool and kids pool with fun waterslide which are surrounded by a neat tropical garden. There is also a flying fox attraction which could be tried by adult of children. For the adults, Yoga lesson is a good way of starting the day with a fresh exercise for your body. For your kids, they will not want to miss the Dino Kid’s Club where they can meet the other kids and play together. They can also follow the dance lesson or meet the Dino mascot and funny clown. The treatments from H’Spa and Happy Feet reflexology are something that you need to try after travelling in this beautiful island. The package includes acupressure, aromatherapy, tone massage, shiatsu, slimming, foot massage and body scrub. Fulfill you hunger with various appetizing foods in the Harrissimo Pizza & Pasta and Harris Cafe, which serves a fine selection of Indonesian, Asian and International dishes. Meanwhile, in the bar you can try a large choice of fresh fruit juices and drinks. With a nice facilities, bright atmosphere, interesting activities, and strategic location Harris Resort Kuta Beach is the best choice for spending holiday in Bali. Our parents booked this hotel during our last holiday in Bali. A suprisingly spacious hotel room awaited us once we checked in. Equipped with a king bed, a decent-size living room, two LCD screens and it’s located next door to a new and developing mall, made our stay quite convenient. Themed in orange color, this hotel looks like a budget hotel, but once you received the bill, it’s not as cheaper as regular budget hotels.